A ball sport is a form of sport or game that is played with a ball. 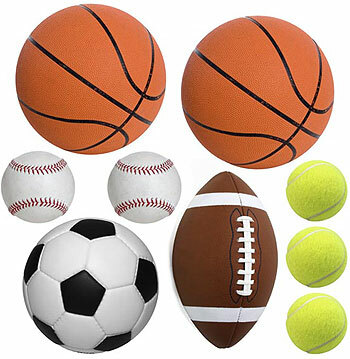 Various types of ball sports have been played throughout the history of mankind. Ball sports are a source of great exercise and entertainment for numerous people all across the world. Different types of ball games are played on both professional as well as amateur levels. In this article, we will briefly discuss some of the most popular ball games of the world, such as baseball, basketball, cricket, football, rugby and tennis. Baseball is a popular form of bat-and-ball sport that is played in several countries across the world, including United States. The game is played with two teams each consisting of 9 players. The main goal of baseball is to score runs by using a bat to hit a thrown ball and afterwards to touch four bases that are set up around the corners of a huge 90-foot diamond. Basketball is a sport played between two teams where the main goal is to throw a ball through a horizontally placed basket for scoring points. The game is considered to be one of the most well-known and highly viewed sports in the world. Apart from professional basketball, the game has many variations which are regularly played by amateur players. The national Basketball Association or the NBA is the official professional basketball league for men in North America. Cricket is a form of 'bat & ball' game that is played with two sides each consisting of 11 players. In this game, a team bats and then do it's best to score as many runs as possibly, while meanwhile the rival team fields and bowls, trying to get the batsmen out. One such batting period is known as innings. As one innings gets over, the other team gets down to bat and tries to score more runs than the first batting team. At the end of the game, the team scoring the most runs wins the game. Football or soccer is a game that is played with a spherical ball between two sides of eleven players each. The game is played in over 200 countries by more than 250 million players, which makes it the most popular sport in the world. The main objective of the game is to score goals by shooting the ball into the opponent team's goal. Rugby football, also known as rugby league or rugby league football is a form of full contact sport that is played with two teams each consisting of thirteen players. Rugby is often cited to be one of the most physically demanding and toughest of all team sports. The game is culturally significant in many places across the world such as Northern England, Southern France, New Zealand, Eastern Australia and Papua New Guinea. Tennis is a sport played between two individuals or two teams each having two players. In this game, the players use a tennis racket to strike the ball over a diving net to the opponent player's court. The game is a popular recreational sport played by millions all across the globe; it is also a widely popular spectator sport. Copyright (c) 2012 ILOVEGAMES.ORG. All rights reserved.